It is becoming increasingly clear that man is ready for a great leap forward. Despite the many tensions and dangers which still exist, and which to many seem increasing, the human kingdom is moving forward and upwards in line with the Plan which guides the actions of us all. The Cosmic Magnet draws everything towards a planned destination; the energies of the magnet wax in power and cannot be withstood. Man must learn and understand the power and benefice of Cosmos. Thus will he grow correctly with the minimum of suffering. The Light of Cosmos shines on man as never before, inspiring him to simplify his life and so regain the connection with the Source which, sadly, he has lost. Were men to heed these words, they would soon enter into a state of Being altogether new in their long journey to perfection. Time, for the old ways, is fast running out. The old thinking and acting, which cause men so much distress, is nearing its end. A new Light sheds its beauty over humanity and brings to a conclusion the aberrations of the past. Thus do We see the future for man as one bathed in the light of the new understanding. Thus do We rejoice at the nearness of the time. Man’s long struggle to build the structures which will serve his rightful purposes is almost over. The required forms are already dimly sensed and soon will break upon his understanding as revelation. From that moment alone, his progress will astonish all but the watching Brothers. We have for long worked towards this end and wait patiently for its enactment. We know that men’s hearts are ready to give form to their loftiest aspirations, to enter willingly into a future as yet unknown, to rectify the mistakes of the past and to begin again on the long ladder of ascent. We know this to be so and have confidence in man’s capacity to change when needs he must. This is such a time. Conditions on Earth are deteriorating rapidly: the divisions which have dogged men for centuries raise, as ever, their perennial problems. The planet groans under the impact of man’s wanton destruction. Men await a sign, an assurance of leadership and guidance, and an opportunity to hope. The signs, for men, are everywhere to be seen. The guidance is assured. The reasons for hope are long and constantly offered. That men heed them not results from fear. Blind, men are, because they are afraid to see. When, soon, Maitreya steps into the centre of man’s affairs, making known the reasons for, and the solutions to, man’s problems, they will see that the leadership they yearn for has long been theirs to enjoy, that the time has come to abandon the destructive ways of the past, and that all unknown, they have within themselves the hope and capacity which will remake this world and set it, once again, balanced and safe, bravely on its destined path. Q. Since Maitreya’s appearances on Chinese television, has He appeared on television in other countries in recent months? A. Yes, in Japan, Indonesia, Vietnam, Malaysia and India; India being the most recent. Q. (1) Reading the list of countries where Maitreya has recently been interviewed on television makes me think that His emergence has entered a new phase again; is that accurate? (2) Is Maitreya planning to rapidly increase the number of countries where He appears? Could it be that rather than a prolonged ‘stay’ and numerous interviews in one country at a time Maitreya intends to appear briefly but in more countries around the world? A. (1) Yes. (2) It would seem so. Q. How many appearances has Maitreya made on television since the last issue of Share International? A. We have no way of measuring it. He has been moving from place to place, giving His advice where He finds a need and a response, bringing succour to humanity. Q. 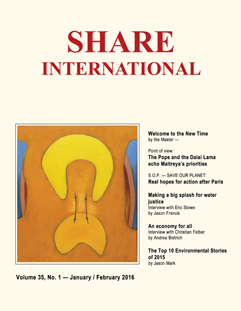 Has Maitreya appeared on television in other countries since the last issue of Share International? A. Yes. He is constantly ‘on the go’, appearing as and where He is needed. Q. Could you please say if any well-known Masters, such as the Master Jesus or the Master Koot Hoomi, have given television interviews in a similar vein to those given by the Lord Maitreya? Q. Share International and your Master have recently called attention to the great work being done by the Pope and the Dalai Lama; are there other such disciples active in a similar, perhaps less high-profile way? A. Yes, in many fields. Q. Is there a karmic reason why the outbreak of the Zika virus has come about now? A. Yes, there is always a karmic reason for such outbreaks. Humanity does not grasp the effects of its actions on nature. Q. Could your Master please say whether a cure for the Zika virus will be found soon? Q. Why is there not a great call for Maitreya to reveal Himself from the media and politics? A. They have forgotten about Him – or if they have not, they will not take the responsibility; they do not want to be the first for fear of being wrong or laughed at. Q. Your Master has confirmed that so-called ‘lenticular’ clouds are often spaceships. This type of cloud, which often has very definite sharp outlines, and a typical UFO-shape, is often seen over mountains, though not exclusively. (1) Do we see them as clouds because the spacecraft are transforming themselves to or from their natural etheric state to a cloud i.e. vapourous state? (2) Do the pilots of these spacecraft deliberately allow their craft to be seen in this rather non-threatening but intriguing state to arouse our curiosity – a sort of nebulous hint? On the last weekend of January 2016 we had a stall with co-workers from the South West at the Holistic Festival at the Lighthouse Theatre in Poole, Dorset. It had been quite a busy weekend with literature given out and some new contacts made. During Sunday afternoon a tall brunette lady who had a long purple coat and a crutch came over and said that she would chat to us later. Right at the end of the fair before we were to pack up the lady came up to me. She shook hands and looked me in the eyes and said: “I am an angel and I have a message that you are doing good work. 2016 will be a special year.” I asked her to repeat this to other co-workers present. I wonder if you could please ask your Master the identity of this special messenger? I could not forget this encounter – was he someone special? On Saturday 19 July 2014*, at 12.30 I was interested in watching CNN News. The television was on already when I entered the room, and the following words appeared on the screen: “May peace prevail on Earth” in old fashioned, colourful letters – nothing else. There was no source for these words and I could not imagine that the Lucis Trust had put an advert on CNN. Right after these words CNN News started with the situation in the Ukraine and the Gaza conflict. Nobody else who I asked saw these words on CNN. When I mentioned it to a friend she said this might have been a miracle. Was it a miracle? I live in Sicily and in order to go to work take the train to and from Catania station, where the homeless or those asking for money or cigarettes tend to gather. I support the homeless and those asking for money, not only at the station but along my routes throughout the city (there are many such souls here), in my own way and as best I can, by giving various amounts of money and sometimes food. For the most part they are beautiful, humble people and I see their existence and role as fundamental on this planet. They are here, in part, to open our hearts. Yesterday, 14 January 2016, I got to the station at around 6pm (it was a cold evening) and noticed a pile of bedding up against the station wall. Sitting beside it was a man reading a book. Beside him, was a cap containing very small change. I did not see the cap at first so I put some money into his hands; in fact, in the centre of the open book. He looked up and thanked me most graciously. I then tried to get more money from a cash machine, but it was sealed for the night. So I went to the station bar and procured a coffee, sugar, and a small ‘pizzetta’ with what I had left and returned to the homeless man. He was not there. Probably he had gone to buy food from a takeaway stall at the station. I stood for a minute, wondering what to do. I caught my train and thought no more about it. But this morning the stranger’s words came back to me, and I found I had tears in my eyes. I am very happy if he was a kind human stranger, for I love to meet them. But was he not just that? On Sunday 16 November 2015 I had a Skype session with my parents and brother for the first time. We were all excited and waving and looking at each other on the computer. Then my mother showed me via Skype a painting of mountains and a lake, which she had just painted. I looked at it and suddenly out of nowhere a bright white oval UFO appeared on her painting and hovered and moved. It was in perfect proportion to the mountains and sea. I was very surprised and overjoyed. I told my family I saw this UFO but none of them could see it. I said I would take a photo of it with my mobile but when I tried, the UFO headed up to the top of the painting, changed into a sort of square, and disappeared. Was this a miracle? (1) On the night of 28 December 2008, my husband Bob and I were asleep, when I awoke to see a transparent figure standing over him. This figure was working furiously on Bob’s legs, moving them back and forth. I noticed how his shoulder-length hair was swaying back and forth. I closed my eyes in disbelief, only to open them again to see the figure still there working on Bob’s legs. I also noticed there was a neon-like halo around the head of this figure. I kept staring, watching and thinking: ‘This has to be real.’ I continued to watch until he disappeared. At the time of this event, my husband Bob was suffering from sciatica. (2) On 31 December 2015, upon leaving a restaurant, I passed by a woman who was wearing a snowman sweater like the one I had given my sister many years ago. I actually backed up to take a second look, and the woman looked at me and smiled. I noticed she wore her hair like my sister Deb, and also coloured her hair the same. The significance of that night was that it was the anniversary of my dad’s death 14 years ago. I also lost my sister Deb on 30 October 2010. Deb and I were like twins, very close. I’m not sure if this was all a coincidence, but could you please shed some light on both of these events? I volunteer one day a week at an agency in the city that provides assistance to recently released federal and state prisoners. On 21 January 2016 we had a tall black man come in for assistance. I did not interview him, but I sat nearby and could not help but notice and pay attention to this person. His behavior was very unusual, but we frequently encounter persons who are challenging and difficult to deal with. This man, who was very loud and boisterous, did not provide us with any documentation about his prisoner status. He indicated he should be there, but did not seem to want to address the details. He was the kind of person who steered the conversation. He had a very strong personality, but was not belligerent. He had a hat on when he came in and a different, brimmed hat when he left. He may have gotten the second hat from our back room, as he did go back there and take some of the clothes we provide. At first I thought he might be the kind of client we might have to ask to leave, but outside of being very loud and a bit difficult for our volunteer to communicate with, he was not problematic. Was this just a regular client with some eccentricities or did we get a visit from someone special? K.G., Overland Park, Kansas, USA. A.C. sent this photograph of patterns of light on a building in Leeds, UK, in 2015. This phenomenon, seen all over the world, is manifested by the Space Brothers in collaboration with Maitreya. A painting and statue of Jesus, as well as a statue of the Madonna and a crown of thorns in a home near Kuala Lumpur, Malaysia, have been exhibiting miraculous properties for more than two years. Miracles began taking place in the house of Anna Maria Pereira in September 2013 when a full-length painting of Jesus started producing oil from hands, feet and heart. The painting has also produced traces of blood during Lent for the past two years. A Madonna statue that Mrs Pereira purchased eight years ago started releasing oil from the eyes in October 2013. During the past several months, the statue has been exuding honey, mostly from the eyes and occasionally from the head. A crown of thorns that the Pereira family bought during a pilgrimage to Jerusalem started producing oil in October 2013. Since Lent 2014, the crown has been producing a mix of oil and blood. A fourth miracle involves a bronze statue of Jesus that has been exuding oil and blood from the heart. Mrs Pereira said the multiple miracles have drawn thousands of visitors to her home during the past two years, even though they were not reported publicly until November 2015. When P.H. from Höör, in Sweden, broke open an egg on 28 January 2016, she thought it must be two yolks because it was such an unusual shape – exactly like a heart. But on closer examination she realized it was in fact one yolk. Then she began to wonder if it was a sign? Photograph sent by A.T., Sweden. I was the guest on the Share On the Air North America radio program on Sunday 22 November 2015. Before going on, the host, Cielito Pascual, and I said the Great Invocation together and then I was interviewed for the hour. Right after the interview was finished, a rainbow reflection of my window appeared on the ceiling of my room in Irvine, California, and lasted for at least 20 minutes until the sunlight was no longer shining into my room. I could find no source that would cause a rainbow of this intensity to form. I felt happy and content when I saw it and watched it, and I wonder if it is perhaps a blessing from a Master? I had a strange experience in early February 2016. While baking bread I threw a handful of flour onto the table and it instantly formed a perfect heart shape. Did the Master Jesus have a hand in my baking? We present a second selection of quotations on the theme of ‘Hope’ from Maitreya (Messages from Maitreya the Christ, and Maitreya’s Teachings – The Laws of Life), Benjamin Creme’s Master (A Master Speaks and Share International), and Benjamin Creme’s writings. Part One appeared in the December 2005 issue of Share International. Ali Abu Awwad (left) and Hanan Schlesinger. Roots is a non-governmental organization and grassroots movement based in the Gush Etzion area of the West Bank. It is dedicated to non-violence and transformation by creating positive change in the relationship between Palestinians and Israelis. Founded by both Palestinians and Israelis, the group endeavors to shift “hatred and suspicion towards trust, empathy, and mutual support,” thereby laying the groundwork “for a reality in which future agreements between our governments can be built,” according to the group’s website, friendsofroots.net. Ali Abu Awwad and Rabbi Hanan Schlesinger helped to found Roots. Jason Francis interviewed them for Share International during their recent lecture tour of the United States. Share International: Could you tell us about your history and what inspired you to form Roots? Ali Abu Awwad: I am a Palestinian non-violent activist. I grew up a refugee. I was born to a political family from my mother’s side. She was one of the leaders of the Fatah Movement [a leading secular Palestinian political party and a faction of the Palestinian Liberation Organization (PLO).] She and I were arrested and we spent years in prison. In 2000 I was badly wounded and my brother was murdered by the Israeli army. Then I started going through the process of non-violence. And I created the Palestinian Non-violence Center in an area of Gush Etzion [in the West Bank, south of Jerusalem] where there are settlements. I started contacting local community leaders, trying to raise awareness and work for Roots. Recently, with leaders throughout the West Bank, I started a Palestinian national non-violence movement called Change (Taghyir in Arabic) because I believe the only solution to the conflict has to be non-violent. SI: Why did you choose the way of non-violence? AAA: For years both nations have been led by anger, suffering and fear, and this leads nowhere. I always say, “Do we want to be right and just right or do we want to succeed?” Even if we agree on a political solution no one can guarantee it unless the two are involved in a deep process of reconciliation. On the other hand, I don’t believe revenge and armed strategies will lead to solutions because everyone on each side will fight until the last drop of blood for their rights and existence. It’s our destiny to live in that land. No one is going to disappear, whether we like it or not. This is the only truth that we have. So we have to control our reactions and direct our pain to solutions and not revenge. SI: Rabbi Schlesinger, could you talk about the journey you took to becoming an Israeli partner in peace with Palestinian peace activists and how you reconcile your peace work with being a passionate Zionist? Rabbi Hanan Schlesinger: I am still a passionate Jewish Zionist settler. The journey was catalyzed by meeting human beings. For all of the 34 years I lived in Israel I have lived ensconced in my own truth, narrative and people. It’s a powerful and meaningful understanding of reality that completely empowers me and gives meaning to my life. It’s the reason why I picked up at the age of 18 and left New York, where I was born, and went to Israel to become part of the return of the Jewish people to our land, going back to the cradle of Jewish civilization after 2,000 years of crying, yearning, hoping and dreaming of coming back and being persecuted and not feeling at home in the cities of Europe, North Africa, and Morocco. With all the power of that connectivity to our historical vision there is a downside – you are not able to see other realities that aren’t part of your grand narrative. Where we live in Israel (what the media calls the West Bank) it’s 95 per cent Palestinian and 5 per cent Israeli, but for the 34 years I was there I didn’t see the Palestinians. They weren’t part of my worldview. I didn’t know anything about their life. Then a year-and-a-half ago I met Palestinians, and it was extremely disconcerting. Meeting them didn’t fit with my preconceived notion of who they were. Meeting them, talking to them and beginning to think about it and look into the information they gave me about their own lives brought me to a place where I understood that until then I was living in partial truth. I wasn’t seeing the full reality around me. So I began a journey that’s one of expanded consciousness of having on one shoulder the Jewish and my Zionist truth, and on my other shoulder the Palestinian people, and beginning to create a consciousness that includes both peoples and my partial truth and their partial truth. SI: How different or similar from your own story are the stories you hear from the Palestinians? HS: Almost everyone involved in our work, at least the people involved in the inner circles, have all gone through some type of inner transformation. And in all the cases it’s based on meeting people from the other side. Many of the Palestinians that we work with have lost a loved one in the conflict. And for many of them their transformation began when they met Israeli bereaved families who also lost a loved one in the conflict and then finding that the pain is the same pain. Ali Abu Awwad describes his first meeting with a bereaved Israeli family where he discovered that Israelis have tears just like Palestinians do. SI: What is the ‘Points of Calm’ project that Roots created? HS: It is opening up lines of communication between local Palestinian municipal leaders and local Jewish leaders. You have to understand that the Palestinians live completely separately: different municipality, legal systems, schools, languages, religions, media and transportation. Everything is separate. That’s one of the reasons why there is so much ignorance, fear, resentment and hate. When violence is added to the lack of knowledge of each side then, of course, that is going to breed the type of hatred that we have. The idea is to bring together local leaders like mayors and religious leaders to have some type of open channel between them. So when something happens they can talk about it among themselves instead of each side reacting in great ignorance and rage against the other side. Another project is the ‘Incident Response Team’. We have lots of events in our area in which Palestinians do evil to Israelis and many events in which Israelis do evil to Palestinians. On the Israeli side we want to make it clear that when those things happen – sometimes it is the uprooting of trees or the defacing of Mosques – that doesn’t represent the majority of us. So we have a team of guys that will go to the Mosque that was burnt, or to the olive grove where trees were uprooted, and we will apologize to the owners and the people. We will explain that it is not us; it is not our religion or our way. We have our work to do to educate and punish the radicals among us. And we want to offer our help in replanting the trees or repainting the Mosque. SI: Could you talk about the projects for children that Roots offers? HS: One of the programs is the photography workshop. We have a photographer from the US who comes over to the Holy Land for six months every year as a volunteer. And he takes groups of six Palestinian and six Israeli children for a five weekly sessions at his photography workshop. They learn to use a camera and see the world through the lens. After five weeks he teaches a second, third and fourth group. We’ve even had an exhibition of the pictures after some of the workshops. These are children who have never ever talked to a peer on the other side in their entire lives. Probably never been in the same room or on the same bus with someone from the other side in their whole life. They have probably never heard someone speaking Arabic except terrorists being recorded on the news. And for the first time in their lives they are in the same place, the same situation, and the same workshop with their peers. The transformation these children undergo is amazing. They come into it with amazing stereotypes that they are hardly even aware of. It is just clear that the other side is either terrorist or violent or vengeful. And they realize instead these are human beings on the other side. That’s going to affect them deeply. Another project is our Summer Camp. For two years running, since we were first established, we have been doing a summer camp for Israeli and Palestinian children, 25 or 35 children from each side. We have arts and crafts, a drum circle, break-dancing, games in a circle, tie-dying T-shirts, working with clay, and a pet zoo. The last day we go to the beach. This year on the way to the beach we went to a dual-language play in Arabic and Hebrew in the city of Jaffa. It’s just amazing how being in the same room or on the same bus together has an effect on breaking down stereotypes. SI: Rabbi Schlesinger talked about the projects that Roots offers for young people. How important is it to reach young people? Also, I say to Palestinians that non-violence is not the ‘rosy’ way you reach your goal. Non-violence can be complex and painful, but it is the shortest way to freedom. SI: How many people has your organization reached thus far? AAA: Around 10,000 people. That includes internationals, Palestinians and Zionists. We receive delegations and talk with other organizations because peace organizations will not solve the conflict if they do not create an international movement on the ground to support, encourage and pressure the political leadership to come up with solutions. We have reached a large number of people and sometimes talk with large audiences through the media. SI: What is the ultimate goal of Roots? HS: It is clear to us that the Israeli and Palestinian people are not psychologically ready for peace at this point. They do not recognize the humanity and the truth of the other side. What we are doing is preparing the ground for peace. We believe that if a peace plan were signed today neither side would accept it. So our immediate goal is to create a cadre of tens of thousands of people on both sides who see the humanity of the other and are willing to find room in their hearts and minds for the other’s truth. That’s our immediate goal and what we are working on. Our ultimate vision is two sides living in harmony – each understanding the other side has rights to the whole land just like our side does. AAA: And I just want to tell the American audience, mostly, that we need you. We need you to stand for a solution. We need you to support our work on the ground. We need your government to pay more attention and play a serious and important role in the conflict. What is happening in the Holy Land can affect your life here [in the US] and what you do here can affect our life over there. So we are part of this international family. It’s a duty for us to create a new generation with understanding and peace. And I hope that one day Jews, Muslims and Christians will be planning together for a better future and having a normal life. I want to say extremism and violence may not disappear, but let us work to create a situation where violence will not be the strongest voice and will not affect our lives by controlling our plans and reactions. Oslo, Norway — On 10 December 2015 Kaci Kullman Five, Chair of the Norwegian Nobel Committee, presented the Peace Prize to Tunisian National Dialogue Quartet representatives Ouided Bouchamaoui, President of the Tunisian Confederation of Industry, Trade and Handicrafts (UTICA), Hassine Abassi, Secretary General of the Tunisian General Labour Union (UGTT), Abdessatar Ben Moussa, President of the Tunisian Human Rights League (LTDH) and Mohamed Fadhel Mahfouch, President of the Tunisian Order of Lawyers (ONAT). The Quartet was awarded the Prize “for its decisive contribution to the building of a pluralist democracy in Tunisia in the wake of the Jasmine Revolution in 2011”. The good news doesn’t always reach the main headlines. A number of pioneering medical achievements made in 2015 might have escaped attention. By now we are all familiar with 3-D printing which seems to offer endless possibilities in many areas of life, not least in modern medicine. In 2015, doctors at the Salamanca University Hospital, Spain, carried out the first rib cage transplant. That in itself would have been an achievement, but what made this experimental surgery unique is that a 3-D chest prosthetic was printed and implanted. Doctors in Spain say this is the world’s first 3-D-printed rib cage, made entirely from titanium. A device has already been implanted into the chest of a 54-year-old cancer patient. The operation was performed on a patient suffering from a sarcoma of the chest wall; doctors had previously removed sections of the patient’s rib cage to access existing tumours and prevent a further spread of the sarcoma. In UK, a medical breakthrough in cancer treatment has been hailed as a revolutionary new therapy. British doctors developed the technology using high-powered beams of ultrasound energy without surgery. The research was carried out by the Institute of Cancer Research (ICR) at the Royal Marsden Hospital in London. The technique was used to kill harmful tissue such as metastatic bone lesions deep inside patient’s bodies. “This technology has immense potential,” said Professor Gail Ter Haar, who is based at the institute. High-intensity focused ultrasound (HIFU) also has capacity to release specially designed capsules of cancer drugs inside a tumour, say researchers. In future, doctors believe they will also use ultrasound to zap prostate, breast and other tumours. Ultrasound wave frequencies cover a range above the audible limit for humans. Low power ultrasound scans are used on pregnant women to generate images of foetuses growing in the womb. The new cancer therapy uses ultrasound beams which are 10,000 times more powerful than those used in pregnancy scans. These beams can destroy tissue by causing cells to heat up and die. Prostate cancer could be treated using probes, directed by MRI scanners that channel ultrasound to specific tumour sites. It is hoped breast cancer could also be treated this way. Lipid capsules containing powerful anti-cancer drugs can be injected into patients’ bloodstreams and circulate until they reach the sites of their tumours. Tissue regeneration research is one of the most exciting fields of modern and future medicine and the list of achievements in this field continues to grow. A case in point is the growing of human vocal cords from scratch. Doctors at the University of Wisconsin managed successfully to bio-engineer tissue which mimics those parts of vocal cords which vibrate in the larynx to create human speech. Five human patients donated cells which were then grown in laboratory conditions for two weeks, and then attached to a larynx using an artificial windpipe. The scientists described the sound made by the cords as a slightly robotic “eee-like sound” – exactly the sort of sound made by real human vocal cords in isolation. In “normal” settings, that is to say with structures of throat, mouth, tongue etc present, scientists are confident that laboratory-generated vocal cords will be able to match human vocal cords. A new movement is taking shape across Europe. Born out of the shared misery, a growing sense of disenfranchisement and disillusionment and coupled with a de-termination that resonates in names such as Podemos and Indignados. A pan-European People Power movement has begun. On Tuesday 9 February 2016, activists from across Europe gathered in Berlin’s Volksbühne to launch DiEM25, ‘Democracy in Europe Movement 2025’, manifesto for a democratic European Union. Many people and organizations are involved in DiEM25, motivated in particular by witnessing the way Greece has been treated by the European Union. People are also concerned and frustrated about the way in which European leaders appear to avoid tackling the real issues facing European citizens. Many are attracted by the refreshing vision provided by Yanis Varoufakis (former finance minister of Greece, Professor of Economics at the University of Athens and Visiting Professor at the Lyndon B. Johnson Graduate School of Public Affairs, University of Texas, Austin). The starting point of DiEM25 is that the EU is no longer really democratic. Indeed simple principles, once understood by a more confident Europe have now been abandoned, such as: currencies should be instruments, not ends-in-themselves; a single market should be fair for all stakeholders, particularly poor countries; take account of the environment and limit capitalism’s worst excesses and self-destructive drives. Finally it should aim at social harmony and sustainable development, through transparency, by pursuing policies to address crises of debt, banking, inadequate investment, rising poverty and migration. DiEM25’s medium-term goal is to convene a constitutional assembly where Europeans will deliberate on how to bring forward, by 2025, a fully fledged European democracy, featuring a sovereign parliament that respects national self-determination and shares power with national parliaments, regional assemblies and municipal councils. DiEM25’s manifesto states: “We, the peoples of Europe, have a duty to regain control over our Europe from unaccountable ‘technocrats’, complicit politicians and shadowy institutions. We come from every part of the continent and are united by different cultures, languages, accents, political party affiliations, ideologies, skin colours, gender identities, faiths and conceptions of the good society. We are forming DiEM25 intent on moving from a Europe of ‘We the Governments’, and ‘We the Technocrats’, to a Europe of ‘We, the peoples of Europe’. Participatory budgeting (PB) lets citizens help decide where their tax money goes. The idea started in 1989 in the Brazilian city Porto Alegre and has found its way into more than one hundred Brazilian cities. Now in 2016 more than 1500 cities including New York, Seville, Hamburg and Mexico-City have implemented a form of PB. Torres, a semi-rural municipality in the state of Lara, Venezuela, is the site of the country’s most extensive experiment in participatory decision-making. In October 2004, the new mayor handed over power to the citizens in a trail-blazing decision:100 percent of the municipality’s free budget (about 700 million dollar) was allocated for citizens to spend as they saw fit. From then on the community of ordinary men and women decided on the city’s budget. At the beginning of 2005 about 550 meetings were held where everyone was welcome to present proposals which needed funding and where delegates were chosen. Ten years later Torres was a different place. Research by the University of California indicates that corruption and cronyism have decreased considerably and the citizens have never been so involved in politics. Numerous houses and schools have been built, roads laid and neighbourhoods renovated. The Trans-Pacific Partnership (TPP) deal was finalized in October 2015 and supposedly creates ‘free trade’ between 12 Pacific Rim nations including the US, Canada and Japan. Trade ministers signed the agreement in Auckland, New Zealand on 4 February 2016. Thousands of people gathered throughout the area to peacefully protest against the agreement, blockading streets, with many hundreds setting up camp outside the building where the signing was taking place.